For ages, we've longed for a pond. I'm not sure if it's because of the time he spent in Japan, admiring beautiful ponds filled with Koi, but Peter, especially, always planned to build a pond. Early in our marriage, he began accumulating bits and pieces for the future pond: a pump for a birthday, a gift card toward pond equipment for Father's Day, a few books about ponds. But life happened. There were greenhouses to build, a house to remodel, a company to start and run. So, the nature-crazy kids finally took matters into their own hands. And created a pond. Yes, that's one of my storage containers they pilfered. Kristen and Michael spend more time outside than inside. Throughout the year, they explore the forest, mess around in the river, and collect specimens to observe. They also return their living treasurers to nature after a brief stint at Chéz Adolf. It's our rule--what comes from nature returns to nature. Spring, though, finds the kids at our neighborhood pond. There's a very short window of opportunity to explore the pond, because as soon as the South Carolina heat and drought ramp up, the pond disappears. This spring, though, with our weeks of rain, the pond is filled to the brim with amazing treasures. Salamander egg sacs--a new find for the kids! I posted the photo on my Facebook page to see if anyone could guess what it was...and I'm proud to report that after many replies of tadpoles, catfish eggs, and various other aquatic creatures, one person guessed correctly. Personally, I had to look it up when the kids came home with not just one but three egg sacs. When the baby salamanders, which I'm certain is not the scientific terms for them, began to emerge, you'd think it was Christmas in April. I love that our kids are so excited about nature. 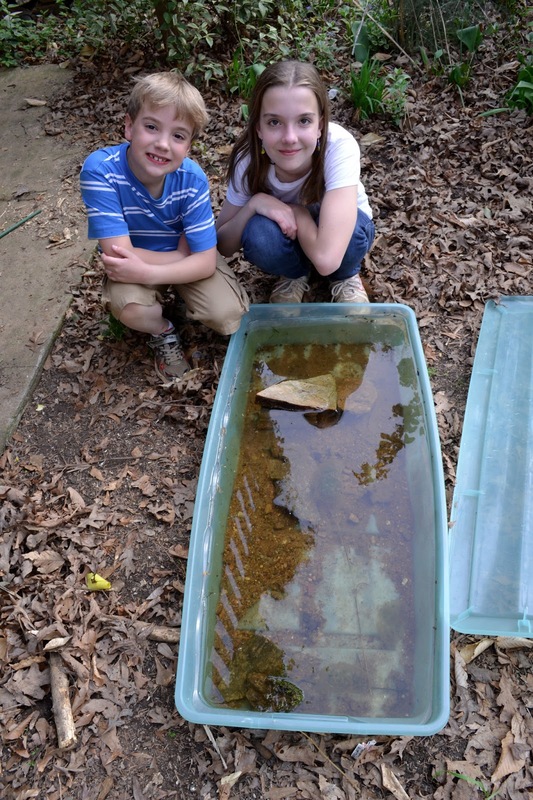 Of course, no pond is complete without tadpoles. Look! One of the salamanders grew legs! The kids add fresh water collected from the neighborhood pond to their habitat weekly to make certain the animals have the microorganisms they need to grow and survive. They also added a few clams they found in the river for biodiversity, plus they made certain to include rocks for the salamanders and frogs to enjoy "land time." The rocks also provide a good hiding spot for the smaller animals. One thing they lacked, though--water plants. I splurged and bought a few plants for the kids to include in the habitat. Our kids amaze me. How did we end up with such creative, nature-loving, funny, silly little people? I may not love plastic bins as the focal point of our garden, and I admit, I'm crossing my fingers and toes that we win a pond in the contest sponsored by Laguna Ponds and P. Allen Smith. Honestly, can you imagine the amazing adventures the kids would enjoy with a real pond? Still, I know that in just a few years, I'll miss the storage bin ponds littering the garden.